Damage-resistant ABS plastic injection molded case and platform. Ideal for simple, weigh-only, small office shipping needs. No calibration required at time of set-up; easily calibrated when necessary. Low profile design stores in a minimum of space. Battery powered for complete mobility; take it anywhere. Round platform design for balanced package placement. 11-lb. Weight-Only Scale weighs items in 0.1-oz. increments. Rates are updated via an electronic process. Scale is powered by four AA batteries (included). Damage-resistant ABS plastic injection molded case and platform. No calibration required at time of set-up; easily calibrated when necessary. 11-lb. 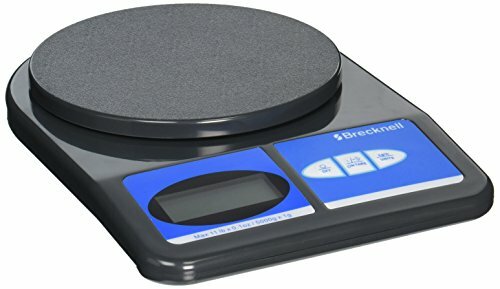 Weight-Only Scale weighs items in 0.1-oz. increments. Rates are updated via an electronic process. Scale is powered by four AA batteries (included). If you have any questions about this product by Salter Brecknell, contact us by completing and submitting the form below. If you are looking for a specif part number, please include it with your message.